Care for a throwback moment? Available starting today, customers can feel nostalgia as McDonald’s introduces two good old-fashioned desserts. These great-tasting and affordable treats will make customers reminisce happy memories and keep them craving for more. Remember the sweet pies and other baked goods that mom or grandma used to make? Or the feeling of going home after school and getting that sweet merienda fix? Customers can look back at those sweet moments with the new Banana Crème Pie Sundae. This indulgent treat is made with layers of rich vanilla soft serve with fine graham crumbs and is topped with banana crème pie-flavored sauce. Customers can also enjoy a classic favorite with the new Golden Rootbeer McFloat, a fun and fizzy rootbeer-flavored drink, topped with vanilla soft serve. 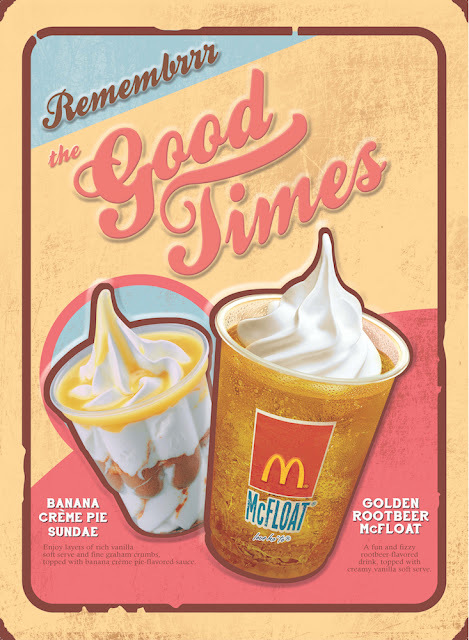 It can be enjoyed on its own or together with McDonald’s World Famous Fries with the Fries N’ Golden Rootbeer McFloat Combo and the BFF Fries N’ Golden Rootbeer McFloat Combo — perfect for those who would like to reunite with old buddies and reminisce the laughter and smiles shared with each other. Remembering feel-good moments has never been this sweet. The new McDonald’s desserts are available for a limited time only in all McDonald's stores and Dessert Centers nationwide. Lovin’ the new desserts? Share your feel-good moments on McDonald’s Facebook page, www.facebook.com/McDo.ph or tag @McDo_PH on Twitter or Instagram.